The epistles also focus the attention of their readers on the imminent return of the Savior.Romans 13:11 commands believers to awake from their spiritual slumber in light of His coming; 1 Corinthians 1:7 and 4:5 encourage Christians to wait on the Lord as they anticipate His return; and 1 Corinthians 15:52 describes just how quickly the events of that day will occur — a day that Paul later calls the “day of Christ” (2 Corinthians 1:14 ; Philippians 1:6 , 10 ) and the “day of redemption” (Ephesians 4:30 ). 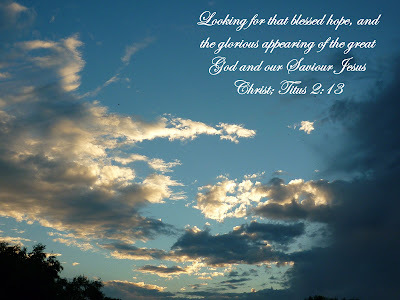 Titus 2:11–14 calls Christ’s coming our “blessed hope,” the great climax of history to which all Christians should look with joy and excitement. And Hebrews 10:37 encourages us to remember that our wait will not be too much longer. In the meantime, we are to “be patient” (James 5:7–8 ) and diligently pursue holiness (1 Peter 1:13 , 5:4 ), rather than doubting His coming (2 Peter 3:3–10 ) or growing spiritually apathetic (1 John 2:28 , 3:2–3 ). After all, when He appears, believers will be fully rewarded for their faithfulness (2 John 1:8 ), while the wicked will be judged (Jude 14–15). So when He says, “I am coming soon” (Revelation 3:11 ,22:12 , 20 ), we are to watch for Him with great anticipation. After all, He may even return today.